I started off playing tape-ball cricket in the side streets of my home city, Hyderabad. No one in my family used to play cricket but my father really liked watching the game and had great interest in it as well. I suppose that love for the game was instilled in me too and I started to dream of becoming famous playing cricket from an early age. Whilst cricket is my focus, I have continued with my studies and have passed matriculate examinations. The idea is to keep on studying as and when I get time away from cricket. My journey in hard-ball cricket started at the age of 13 when I joined the Sindh Cricket Academy which is based in Hyderabad. Based on my hard work with the club, I was asked to play for the Hyderabad Under-16s in their matches in the Pepsi PCB Cricket Stars Under-16s Tournament in 2015. I took 8 wickets in 3 matches and based on this and after the trials, I was selected for the Pakistan Under-16s tour of Australia in 2016. This was my first experience of an overseas tour and I feel I did well where I picked up 4 wickets in 2 One-Dayers and 2 Twenty20 matches. On my return from Australia, I took part in the Pepsi PCB Cricket Stars Under-16s Tournament (2016) but this time my performance was even better with 11 wickets in just 4 games. My good form at the Under-16 level allowed me a chance to play at the regional Under-19 level where I continued bowling well taking 8 wickets in the Inter Region Under-19 One Day Tournament 2016/17 and 10 wickets in the Inter Region Under-19 Three Day Tournament 2016/17. The Under-16 and Under-19 performances were a key factor in my selection in the Pakistan Under-19 teams for 2 ACC Asia Cup tournaments. In the 2016/17 Asia Cup which was played in Sri Lanka, I took 6 wickets in 3 games. This was my first major overseas tournament and I feel that I could have done much better, and possibly the results did not match the effort that I put into my bowling. I was also selected for the 2018 ACC Under-19 Asia Cup but unfortunately did not perform that well due to a variety of reasons, picking up just 1 wicket in 3 games; still, I do feel that I learnt a lot from this experience. It all started really well. I was handpicked by Islamabad United Head Coach Waqar Younis after he saw me in the nets at the NCA. He really liked my bowling and felt that I was a good choice as a fast bowler but then disaster struck for me. I had been struggling during the season with what I thought was a minor foot injury which was causing pain, but scans showed that I had a hairline fracture and so my dream of playing in the PSL this year came to an abrupt end. I was devastated by this injury as not only did I miss the PSL, I also could not be part of the Pakistan squad for the Under-19 World Cup which was played in January-February of 2018. However, I am grateful to Mudassar Nazar and the coaching staff at the NCA who helped me get through this injury and got me bowling once again, and back to full fitness. I am able to consistently bowl in the range of 135-140KpH and hopefully this will improve as I play more cricket and work on my fitness and training. Whilst the bouncer is my primary weapon for taking wickets, I am also working on improving the line and length of my deliveries and want to be able to bowl good yorkers too so that I can get many more wickets in the future. I have a few role models who I try to emulate whenever I bowl. Shoaib Akhtar, Mohammad Sami and most importantly Waqar Younis are the Pakistan players whose videos I watch a lot to see if I can improve my bowling. Adam Milne of New Zealand is the non-Pakistani bowler I admire the most and whilst I have met Shoaib Akhtar and Waqar Younis, I would love to meet Milne one day and talk about my bowling with him. I am currently taking part in the Quaid-e-Azam Trophy and One-Day Cup and looking to get back into rhythm, and am looking to pick up wickets for my team PTV. After missing out on participating in the previous edition of the PSL, I am very keen to be picked again for one of the franchise teams so that I can showcase my skills to the world. 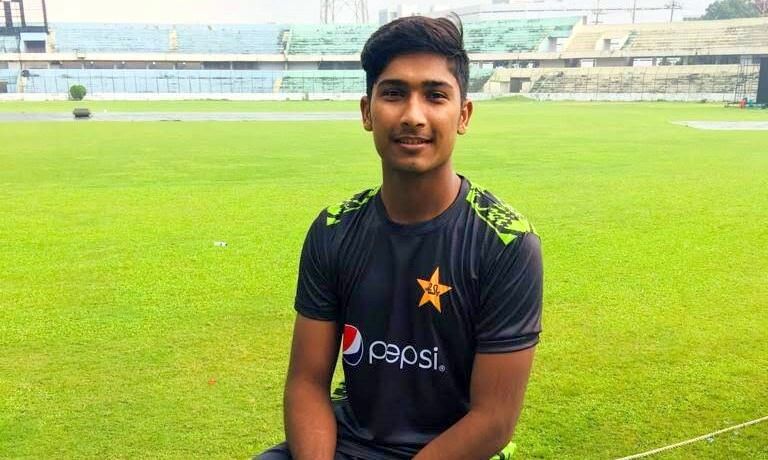 Of course, my ultimate and most important aim is to play for Pakistan in the future and not just find a place in the national team, but also to help my country win matches.